we are engaged in manufacturing and supplying high quality Industrial Reactors like: -M.S. Reactors, High Pressure Reactors, Chemical Reactors, Jacketed Reactors, Process Reactors, S.S. Reactors, Chemical Process Reactors, Limpet Reactors, Mild Steel Reactors, Limpet Coil Reactor, Limpet Coil Vessel, Industrial Reactors. Under the offered range, Provided reactors are able to fulfill the requirements of our customers as these are manufactured by using premium quality raw material that is sourced from the honorable vendors of the industry. In addition to this, we adhere to globally laid quality standards while manufacturing these reactors. 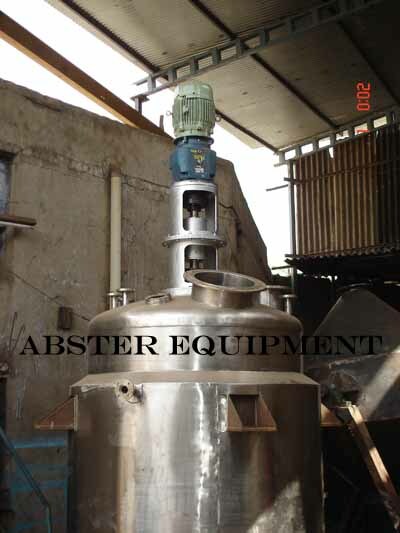 Abster Equipment manufactuing a chemical reactor or reaction vessel that are vessels design to facilitate chemical reaction for difrenet type of chemical, Bulk drug reaction known as reactants. SS Reactors Vessels are also used for other processes such as solids estarification, dissolution, product mixing, distillation, crystallization, liquid/liquid extraction and polymerization. We are a chemical reactor manufacturer for Chemical, Pharma and Bulk Drug, Resin manufacturing industries.